A beach that needs little fanfare is the island's longest beach in the resort of Playa d'en Bossa. Going from one end to another, you'll see it change from VIP glitz and glam one moment to wild beach party the next. Beach clubs, bars, restaurants and hotels, it's all here. If you want Ibiza in microcosm, then this is the beach for you with the many vibes of the island from out and out party to hippy chic. A true mix of people come here with party people, families, locals and the well-heeled. Incredible views of the sea, Formentera in the distance and the walled citadel of Ibiza Town only add to the mix of experiences. With one of the best selections of water sports and boats on the island, you'll find more to do than just lazing in the sun. We love to walk from one end to the other, taking in the beach's changing face as we stroll in the sand. It's a spot to hear the most bravura of Balearic beats too. 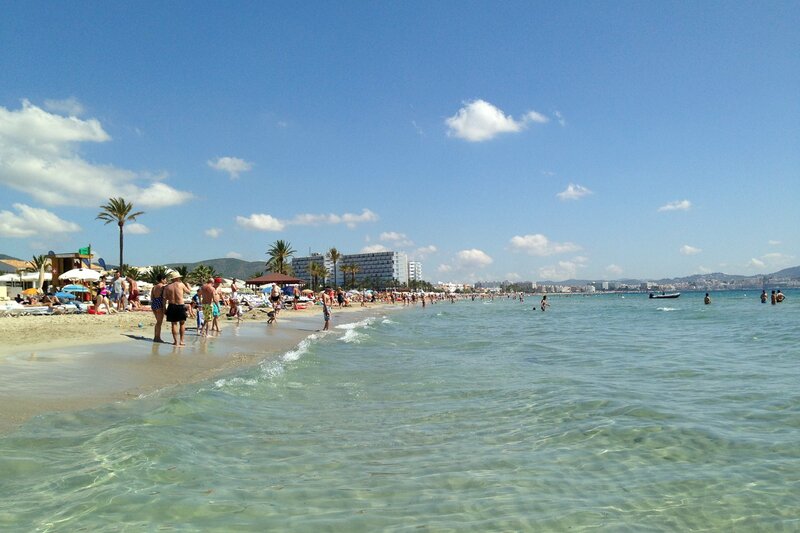 It's easy if you are staying in Playa d'en Bossa as it's just a short walk. Driving there is easy and there's a lot of free parking plus there's a regular bus service from Ibiza Town. One of our favourite spots to soak up some sounds is Nassau Beach Club and to get an idea, listen to its soundtrack on Ibiza Spotlight's Spotify page.